"Eat your liver, it's good for you," may be the understatement of all time. In 1934, three physicians won the Nobel Prize in Physiology or Medicine for discovering that liver successfully treated pernicious anemia. This highlights the nutritional value available through one serving of beef liver. In addition to the iron that prevents anemia, beef liver is a rich source of vitamin A, B vitamins and zinc. Unfortunately, it's also very high in cholesterol. A 3-ounce serving of braised beef liver has 162 calories. The same portion also supplies 24.7 grams of complete protein, which is 54 percent of women's and 44 percent of men's recommended daily allowance. With only 4.5 grams of total fat, a serving of beef liver can fit into your daily fat intake. The problem is in its cholesterol content. This serving contains 337 milligrams of cholesterol, which exceeds an entire day's recommended intake of cholesterol. The American Heart Association recommends limiting cholesterol to less than 300 milligrams daily. Beef liver is a rich source of vitamin A, which means it helps keep your eyes, skin and immune system healthy. A 3-ounce serving contains 26,957 international units, or almost 700 percent of your recommended daily allowance. The same portion supplies more than half of your recommended daily allowance of folate and vitamins B-6 and B-12. Folate is especially important for women because it prevents birth defects formed in the first trimester of pregnancy. Vitamin B-6 helps produce serotonin, which regulates moods and your sleep cycle, and vitamin B-12 is essential for nerves and red blood cells. Beef liver is well-known as a source of iron and for good reason. A 3-ounce serving supplies 31 percent of women's and 70 percent of men's recommended daily allowance. Iron in red blood cells helps carry oxygen throughout your body. Without a sufficient supply, your risk of developing iron deficiency anemia increases. Iron also has other roles throughout your body, including supporting your metabolism and immune system. Liver is a rich source of zinc, with one serving supplying 56 percent of women's and 41 percent of men's recommended daily allowance. Zinc is also essential for a healthy immune system and it helps regulate DNA. The form of vitamin A you get from liver can become toxic if you eat too much, so you should not consume more than 10,000 international units daily. In spite of its nutritional benefits, with so much vitamin A and cholesterol, consumption of beef liver should be limited. Prepare liver by rinsing it under cold water. After drying it, dredge it in a little flour and saute it in olive oil. Depending on the thickness of the liver, it shouldn't take more than a few minutes on each side. Be careful not to overcook the meat because it quickly becomes tough. After you take the liver out of the skillet, put salt-free beef broth and red wine vinegar in the pan, scrape up the brown bits and serve it over the liver. 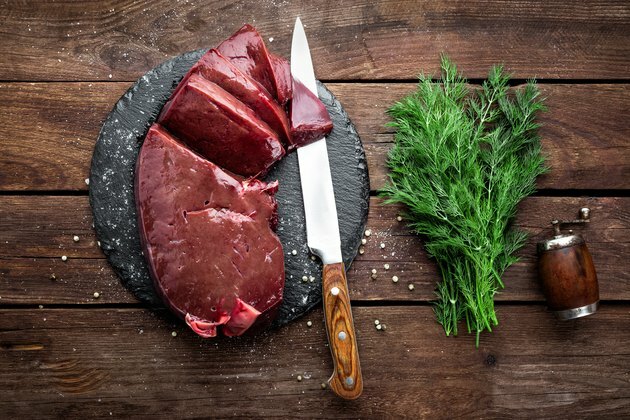 Is Beef Liver Bad for Your Health?